2008 has been a great and eventful year for me and my wife, and we both hope 2009 will be the same. We hope you are pleased with 2008 as well, and we both send you the best wishes for the year to come! A wonderful summary of 2008 has been made by Eirik Solheim, in a 40 second video showing the beauty of the 4 seasons. Enjoy! P.S. Check eirikso.com for info on how he made it, and even download it in HD if you would like that. Here comes another geeky joke, this time you won't need a computer science degree to get it. Some math knowledge will help in understanding and appreciating the joke though. An infinite number of mathematicians walk into a bar. The first one orders a beer. The second orders half a beer. The third, a quarter of a beer. The bartender says "You're all idiots", and pours two beers. Driving our rental car out of Rome, on our way to Tuscany, we both had a feeling that we had seen some amazing sites, but that we had not seen true Italy. We had rather seen a city where everything was more or less taken over by tourism. 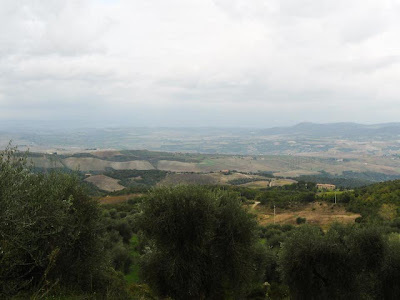 This all changed from the moment we drove off the A1 highway, and entered the narrow winding roads in the countryside of Tuscany. Being dark already, it was a mysterious landscape we drove through. Passing old brick buildings, driving through small medieval town on the hilltops, and trying to see what was around the next corner. The most special moment was probably when we saw an old fortress/castle all lit up on a hilltop. We were both very excited and could hardly believe we were actually driving through this fantastic, wonderful area. 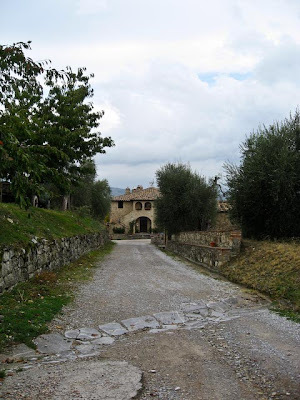 We finally found our way to the olive farm/resort Le Casacce, where we were going to stay. Arriving there we were greeted by Enrico Casini, the owner of the place, wearing his signature red glasses, saying, "Welcome to my house", and by Max, Enrico's dog. Since we arrived a bit late, we headed straight of for dinner. We had learned of this place from a colleague of mine, and she had told that the food was really good. Because of that we were excited and curious about what we would be served, but at the same time didn't really know what to expect. The first dinner turned out to be one of the best meals I've ever eaten. We were the only guests there (it was low season) so a staff of three or four people was working on our dinner. We were even seated in the living room instead of the restaurant area, making it even more personal and intimate. There was also a fire in the fireplace next to our table. It all felt a bit surreal, but very cozy and romantic as well. We were served a six (!) course dinner, with antipasti (appetizers), soup, primi (pasta dish), secondi (meat dish), cheese plate and dessert. All the courses were really good, but I especially remember the homemade pasta and the beef with mashed potatoes. And all with the house red wine, which was very easy to drink (Minnie loved that), but still an interesting wine. We both knew after that meal that we made a really good decision staying here (and this was only the first night). The day after we were finally able to enjoy the view from our apartment, looking out on valleys covered with olive trees or vines, and old yellow brick houses spread around. The weather was grey, but the view was still wonderful. The picture below does not do it justice. You often see postcard-pretty pictures from places, showing off the areas they are proud of. But so often, these pictures only represent a small area, and therefore giving a false impression of the place. People visiting it as tourists then often get disappointed to see that the place as a whole is far from as nice as the pictures. This is not the case with the countryside in Tuscany, not at all. It was stunning to see how valley after valley looked just like the postcard pictures. 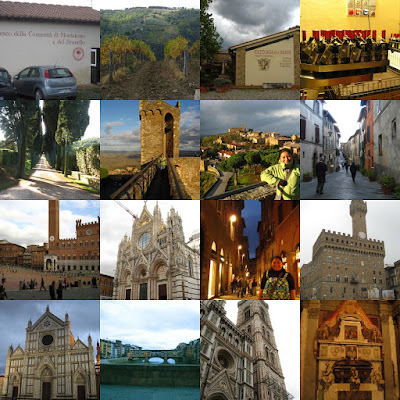 We spent 4 days in this area, and made daytrips to Florence, Siena and Montalcino (where the great Brunello di Montalcino wine is made). 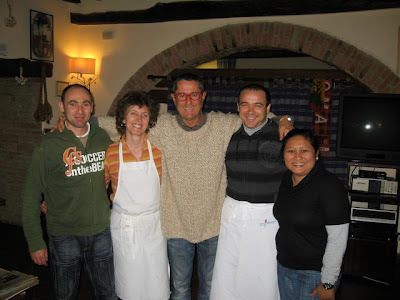 Every day we came back to the amazing dinners at Le Casacce in the evening (the menus listed in the bottom). We had an amazing time, and highly recommend a trip to this area. I promise you will leave with a feeling of having experienced genuine Italy. We sure did. - Primi: Homemade pasta, cut in triangles, with tomato-sauce with meat. - Secondi: Beef, from a local breed, with mashed potatoes (but without any milk, butter or egg, just pure potato). - Bonus-dish (I think this was a spontaneous thing): Cheese-plate with sliced pears and walnut-honey. - Dessert: Homemade ice-cream with chocolate topping. - Antipasti: Something very similar to carpaccio, but with cured meat (a sort of prosciutto I think). 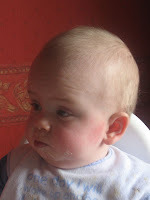 - Primi: A locally produced pasta, we don't remember the name of the type, with tomato sauce with meat. - Secondi: Beef in white wine sauce with a side salad. - Primi: Giant tortellinis (just two pieces to fill the plate) with ricotta cheese and something else we don't remember the name of. - Secondi: Meatballs in tomato sauce with boiled potatoes with basil. - Dessert: Butterfly, the chefs own creation. It basically is vanilla cream with super thin flakes of pasta placed in the cream to make it look like a butterfly, and then its topped with warm chocolate. Another thing that disappointed us was the public transportation system. This big city has only two metro lines, and it's about 7 minutes between each departure. The result is that the trains are packed most of the time, and it's chaos when people get on and off. I really don't understand why they don't get more trains and run more frequently. Taking a bus is not tourist friendly at all, both because you can't buy tickets on the bus, and because there's no announcement of the stops, making it very hard to know when to get off. 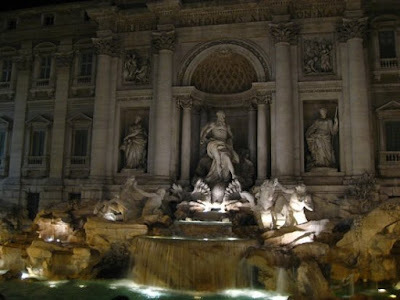 The reason for going to Rome is of course the sites. And there are some truly, truly amazing sites here. 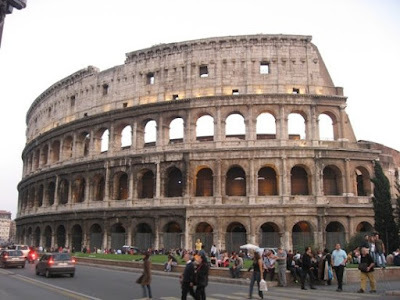 The first one we did was ancient Rome (Colosseum, Forum, Palatine Hill). The size of the Colosseum made a great impression, it's hard to grasp before you're there. We took part in a guided tour, and it was great to hear the stories of the place, and trying to imagine how it was during games. The Palatine hill was a very scenic place, and has a lot of great history to it, but then again so little is left of the the original buildings that it is hard to imagine how it once looked. I would think Forum, and the surrounding ruins, is the most significant historical place we went to. A large part of Forum still stands, giving a good notion of how big it was. The ruins around Forum is mostly reduced to small parts of the original buildings, which means it gives little hint to how it was originally, and it tends to just become one ruin after the other. Maybe a guided tour would be the best here if you wanted to understand the history behind it all. After lunch, we went to the Pantheon. Pantheon is known for having the largest masonry vault ever built, and it is extremely old, completed already in year 120 AD. 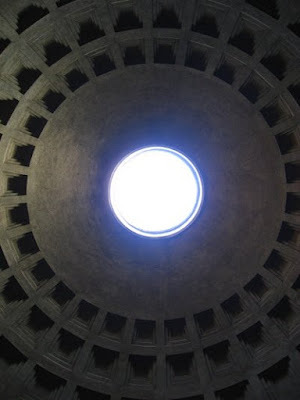 The dome is 43,3 meters high, and has a circular opening at the top that lets light in, and, when it rains, also water. At the very centre of the floor, you find draining holes to let the water out. You do earn a lot of respect for the ancient builders when visiting the Pantheon. We also went to the Spanish Steps. What a disappoinment, that has to be one of the most overrated tourist attractions ever. There's not even a nice view from the top... After that we walked to the Trevi Fountain, which was not disappointing at all. That was a very nice site, highly recommended. 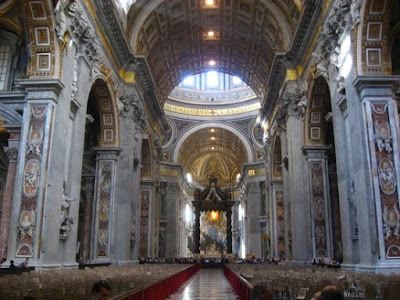 The day after we went to the Vatican. First going through the Vatican Museum, seeing a lot of amazing paintings/frescos, tapestries and of course the Sistine Chapel with Michelangelo's amazing fresco in the ceiling. It is always a strange feeling seeing for yourself what you have seen so many times on tv or in pictures. Can McCain Catch Up and Win? I take part in the guessing game so many others in the world also take part in nowadays, "Who will win the U.S. Presidential Election?" We can tell from the media, both international and local, that Obama is ahead of McCain. The impression I get, and I would think many others get, is that McCain still have a chance. The latest poll shown on BBC News tonight shows the Obama has 50% and McCain 43% of the votes. It's a lead, but it's only 7%, with a +/- 2% margin of error, and there's still 16 days left till the election. It seems to early to conclude, at least from what the big media tells me. So what does these numbers really say? Well, they tell how many of the registered voters nationwide will vote for Obama, McCain or haven't decided. Here's the thing though, the nationwide numbers is not important, it's the electoral votes that matter. As you might know, the electoral votes are handed out by the states. For most of them, the candidate that gets more than 50% of the votes from the citizens, gets all the electoral votes for that state. In theory this means that a candidate with much less than 50% of the nationwide votes can get the majority of the electoral votes (if he wins small in many states, but loses big in other states). So who has the most electoral votes, based on the polls? Here is an electoral map from RealClearPolitics. Obama is 131 electoral votes ahead. And this is actually quite a cautious prediction, other sites give Obama even a bigger lead. Just to confirm that Obama really is as far ahead of McCain as the electoral vote numbers say, I checked the betting odds for the election from a U.S. betting company. Betting companies' whole business is dependent on giving precise odds, so the odds tend to be a good indicator. McCain gave an odds of +350 and Obama -600 . That means that if you bet $100 on McCain, and he wins, you get paid $350. If you bet $600 on Obama, and he wins, you get paid $100. Obviously the betting companies are certain Obama will win. Edit: It seems like some media is acknowledging this, judging from this headline: "Obama aiming for chocking victory" (as of this writing, the top story in the biggest Norwegian newspaper). 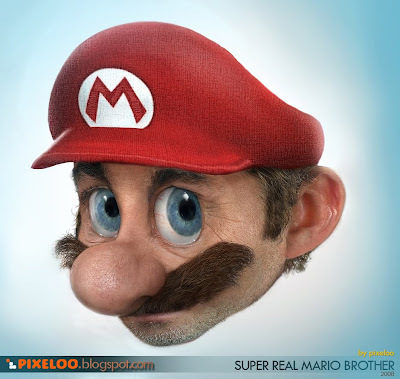 When you have played a few online games, you discover that you rarely find games that are truly original. Usually it's just a new twist to an old idea. Not so with Cursor*10.
it would be something like this..."
This video really grabbed me. And left me silent when it was over. Rarely does 3,5 minutes of video make such an impression on me. You can watch the video on the site of the project (no music, but better quality) or you can watch the YouTube-copy here (with music). 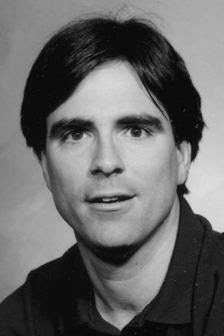 "In Memoriam: Randy Pausch (1960-2008)"
I clicked on the link today, and spent more than an hour watching a university lecture unlike any lecture I've ever seen or attended. But more on that later. As I started studying for my bachelors degree this changed. A few of the students at my university college really impressed me. They were smart, they were able to achieve great things and at the same time they were really nice and friendly. This was people that made me think "I wish I was like that". And I saw what being a natural leader meant. I found my first role models. When I moved on to university I met a lot more people like this. It was inspiring to be around these people, it made me want to work a little harder, and set my goals a little higher. I understood the value and importance of good role models. Another quality of a role model, and a very important one, is showing strength in hard times. It's in the tough moments and times you see what people are made of. One person who has showed this strength in a wonderful way is the man Google honors on their web site today, Randy Pausch. He died from cancer yesterday, and displayed strength in hard times in a very special way at the end of his life. He was a professor at Carnegie Mellon University in computer science, recognized for his work in computing education and human computer interaction (HCI). What made him gain world wide fame was his amazing "The Last Lecture". Full version here, and a news story about Pausch and the lecture here. This was given in September 2007, at a time he knew he was dying from cancer. The title of the lecture was "Really Achieving Your Childhood Dreams," and told of his childhood dreams and how he achieved most of them. Pausch was upbeat and humurous during the lecture, while not being in denial, not at all behaving like one might expect from a dying man. The lecture is very entertaining, touching and inspiring, and shows a man with an amazing strength when facing the end of his life. He was definitively a great role model, not only by showing strength when facing death, but also in many other ways, and I think the memory of him will inspire many in the time to come. - It was established in 1961, and been arranged every year since - making it one of the oldest jazz festivals in Europe. - During Moldejazz, the number of people in Molde is estimated to be five times as high as the rest of the year. Molde during Moldejazz is a different town than the rest of the year. - Some of the most famous jazz artists visiting the festival is: Chick Corea (3 times), Miles Davis (2 times), Pat Metheny (2 times), Herbie Hancock (5 times) and Dizzy Gillespie. 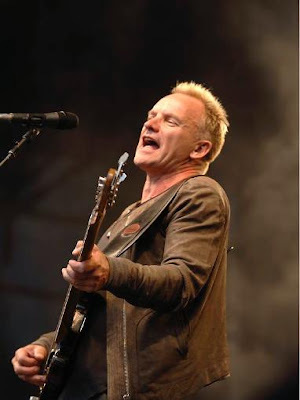 - The 2008 festival: 6 days, 16 different stages, 61 concerts, 54 artists/groups. The festival is not only jazz. To secure enough income, and to make it a festival for everyone, not just the jazz-lovers, the festival always features one or more big non-jazz artists as well. These concerts are held at the wonderful out-doors stage at Romsdalsmuseet (The Romsdalen Folk Museum) with a capacity of about 8000. These concerts have always been the subject of discussion, some feeling that it's wrong that Moldejazz features non-jazz artists. Big non-jazz artists featured on that stage have been Sting, Mary J Blige, Lauryn Hill, Stevie Wonder, B.B. King, Ray Charles, Santana, Eric Clapton, Bob Dylan and Blues Brothers. One of my favorite pod-casts is "Best of YouTube". Today a video called "Roots of Breakdance" dumped into my iTunes from that podcast. I totally love it and had to share it here on the blog. Sometimes when I think back on my life, I can't help feeling that I have been very lucky to end up where I am today. So many times have coincidences and things out of my control turned out in my favor and moved me towards where I am now. However, I am convinced that the luckiest moment of my life was where it started. The fact that, in 1976, I was one of the babies born in Norway, and because of that got to grow up here. Using the UNDP Human Development Index, what probably is the best index to tell how good a country is to grow up in, we see that Norway now is the second best country. Number one is Iceland. The total population of these two countries is just above 5 million. So, if you're born in Norway or Iceland, you are one of the 5 million persons that live in the best two countries in the world to live in. It is pretty lucky to be amongst those 5 million. 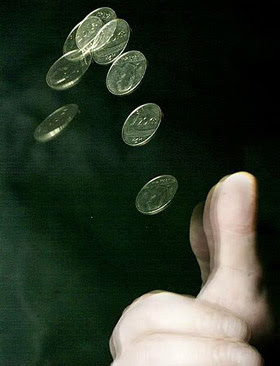 To illustrate how lucky, imagine you play heads or tails with a friend. The first time the coin is flipped, it lands on the side you picked. The second time it does the same. The same for the 3rd time. You're very pleased with your luck today. And you keep playing. And it keeps landing on the side you pick. The 4th time, the 5th time and the 6th time. This is unbelievable! And there's no cheating, it really is just pure luck. Again, the same happens the 7th time, the 8th time, the 9th time and even the 10th time. We all know this kind of luck never happens in real life, right? Well, it happened to me when I was one of the babies born in Norway... And every baby born in Iceland or Norway has the same luck. For every single person living in Norway or Iceland, there are about 1300 persons living in countries below Norway in the UNDP index. The target group of this movie is women in their 20's and 30's, and certainly not men. I think they hit the target spot on :) Clearly, this movie, and the series it comes from, appeals to the feminine mind. 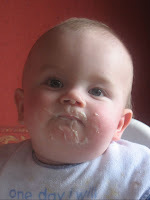 After discovering the universe of blogs, I've started following quite a few blogs. The only way to easily do this, is by subscribing to the blogs. This is done using a technique called RSS. Explaining RSS is not easy, but luckily someone is really good at explaining things in plain English, even RSS. Check out this video from Common Craft which in a very easy and understandable way explains RSS. One addition to what was brought up in the video. 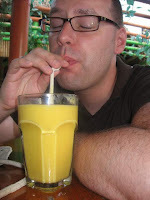 Do you use iGoogle? Google Reader can be set up in your iGoogle-page. I use it, and it works perfectly, and I don't need to open the Google Reader site to check on my subscriptions. It's always fun to experience something original, something you would never think of, something that just blow you away. Especially when it's comedy. The Japanese tend to come up with stuff that matches this description for their tv shows. There's more from the same show here and here. 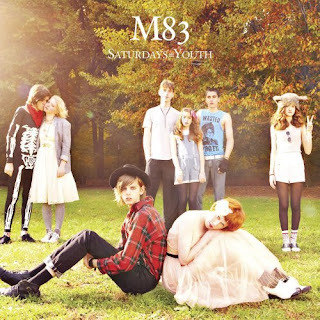 Currently I'm in a period listening to mainly alternative music, and my current favorite album is M83's "Saturdays=Youth". I think of M83's music as similar to bands such as "My Bloody Valentine" and "Serena Maneesh" (shoegaze), but with a melancholic touch, a bit like Type O Negative's "October Rust". My favorite traks are track 2, "Kim & Jessie", and track 3, "Skin Of The Night". Sadly, none of those are included in their mySpace-page, but that page still is good to get an idea of their style of music. Minnie and I enjoy going to historical sites when we're in the Philippines. Minnie had heard about these walking tours in the old Spanish part of Manila, Intramuros, and booked us for doing such a tour. 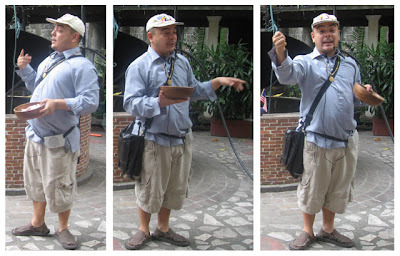 These tours are guided by a man called Carlos Celdran. I didn't really know what to expect, but were intrigued to see some of the old historical Manila. The tour goes through the sites chronologically, starting with the Spanish era (Philippines was a Spanish colony between 1565 and 1898). The guide explained how the Spanish king was not very fond of the Phils, since there was no gold there. Ironically the Phils had lots of gold, it just wasn't discovered until after the Spanish era :) However, this led to the king not spending the money and people needed to teach Spanish to the Filipinos, or establish a strong Spanish rule. Instead a lot of catholic priests went to the Philippines, converting the Filipinos to Christianity and making the Catholic Church the de facto ruler of the Phils. Because of this the Phils are one of the few former Spanish colonies not speaking Spanish, and also the only Asian country where Christianity is the main religion. This was something I didn't know, and the guide explained this, and many other sides of Filipinos and the Phils, in a very understandable, and humorous, way. He used a lot of comedy during his tour, which made the tour really fun. 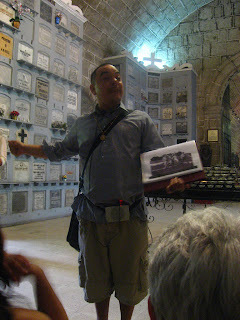 At a time he was talking about how short the Filipinos were in the Spanish era, due to their diet. 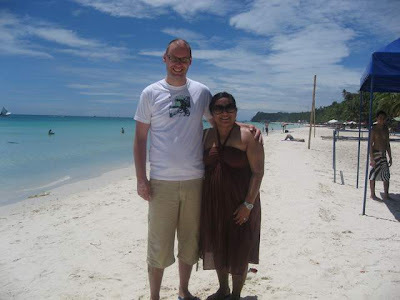 He compared them to Gloria M Arroyo, the current president in the Phils, which is 150cm/4'11" tall. He made a great joke on her expense: "Have you seen Gloria step out of her presidential Ford Exhibition? She looks like she is going skydiving!". There were lots of jokes throughout the tour, and many of them on the cost of various Filipino celebrities. The guide also used a lot of props, carried in a bag. The most important was a folder with pictures he used to illustrate his stories. And he really flipped to those pictures at an amazing speed! One example of use of props where when he finished speaking about the Spanish era, and went over to the American era (the Philippines were an American colony/commonwealth from 1901 to the WW2). He then pulled out an American cap (with stars and stripes), American flags and played American music (possible the Star-Spangled Banned, not sure), and led us from one part of the museum to the other, all walking like in a parade. Before telling about the war, the guide led us into something similar to a tomb, where the walls were covered with small rooms for urns. While doing this, the guide were wearing a set of ”Douglas MacArthur-props”, including a cap, sun-glasses and the signature pipe. In the middle was a monument, and we were all told to sit down. This part would prove to be the most intense and emotional part of the tour. Manila was invaded by the Japanese the day after Pearl Harbor, and the fight against the Japanese was lead by Douglas MacArthur, which then was the allied commander in the Philippines. After a short period, MacArthur fled the Phils with his troops, stating the famous words ”I shall return”. One of the pictures the guide carried was of a bomb falling down on Manila. This bomb was part of the bombing campaign that put pretty much destroyed all of Intramuros, with the exception of the cathedral we were in. That was spared because it was a red-cross head-quarter. 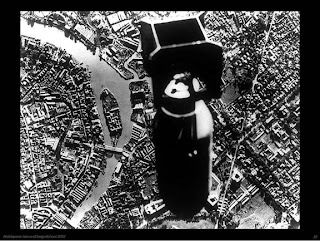 The big surprise for me was that this bombing was done by the allies, that the Americans destroyed the town that they had spent so much time and money on building up since 1901. A really sad story, but that was how warfare was done in that era. 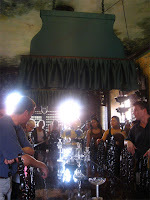 The last part of the tour took part in a mansion, which was built to be a classic Spanish mansion. This was actually a project of the infamous Imelda Marcos. The guide described Imelda like this: She doesn’t seem to have an evil bone in her body, but what happens in her head is a mystery, she seems to be on a different planet. We were getting worried about the bride though. She was doing so much of the preparations on her own, and had been super busy since Thursday. From Thursday till Saturday she had only slept one hour. We were just hoping she wouldn't collapse of tiredness in the wedding. However, when i got to see Winnie, I couldn't tell that she had slept so little before the wedding, and it didn't seem to bother her during the wedding ceremony and reception either. The wedding reception gave me two good examples of the differences between Norway and the Phils, the first being the climate. If having a party indoors in the Phils, especially during summer, air conditioning is very important. Sadly, the air con broke down in the house the reception was held. To add to the crisis, the owners of the house had no contingency plan either, not even fans... With a lot of people in not that big a room, it got very warm and stuffy, resulting in a lot of guests leaving shortly after the dinner. I know Winnie felt really bad about this, but at least her close friends (which were the group I were in that evening) and family stayed so the party didn't die all together. The second big difference is how the filipinos party compared to Norwegians. It's amazing to see for a Norwegian how filipinos are partying hard from the first dance, while Norwegians needs to marinate in alcohol for a couple of hours first... This meant that a lot of the guests, including Minnie, had a blast from the first song the band played, while I just sat by the table drinking wine and beer. After a couple of hours I had drunk enough to dare take part in the dance floor in the same way as the other guests. Then the other big difference in partying showed itself, the party was at its end and it was only 10pm! I was just getting started... To sum up: Filipinos party intense over a short time, while Norwegians takes a long time to warm up, but the party lasts much longer. 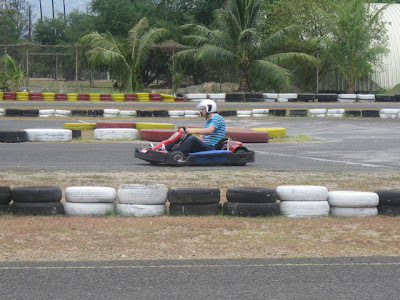 I had a good time in Subic, attending my first catholic wedding, karting and everything. I also hope that Winnie will be able to remember the good times we had with her in the reception, not only the problems caused by the air-con failing, when she in the future think back to her wedding reception. After the morning swim and sunbathing, we go back to our room and freshen up and get in our regular beach wear, and usually rest a bit. Then we're off to lunch, and after lunch walking around the D'mall (the "mall" here in Bora), going to our favourite internet cafe, getting a massage (applies for Minnie only) or just walk around the beach a bit. After the sunset, we typically go back to our room for a rest again, before going out for dinner later in the evening (typically around 8). 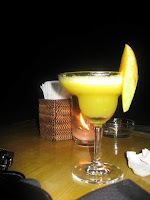 After dinner we find a place to sit down for a couple of beers, or in Minnie's case a mango margarita, and enjoying the cool evening breeze. Does it sound boring? Well, I guess you can tell we really have been relaxing while being here :) And it hasn't been boring either, mostly because I'm sharing the time here with my best friend and wife, Minnie. On sunday evening we went on a long walk along the beach towards the north end. 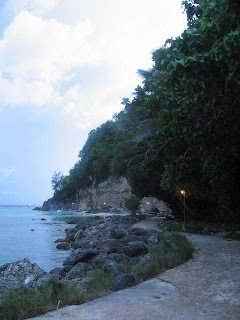 We decided to follow the small path that leads from the north tip of the main beach until a small secluded beach. On the way we passed by Sea Wind, the resort where we got married, saw all the new and large resorts built at this end of the beach, including Discovery Shores, the new resort for the very rich here in Bora and we passed by a water snake (no idea if it was dangerous...). Since this being quite far from our resort, and we are here to relax after all :), we took a tricycle back to our resort. Yesterday was quite a big break from our routine though, as strong winds and very heavy rain made us stay a lot of the day in our room. It's always special for a Norwegian like me to experience heavy tropical rainfall, the intensity and volume of rain is way beyond the weather at home. However, today, the weather was all back to normal, with sun and breeze only. The only signs of yesterday's violent rainfall were that a river had dug out a lot of sand at the beach close to our resort, and that the seawater was colder today. 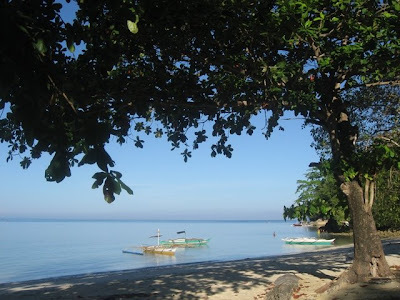 After the boat ride to the island, a short drive and the last walk to our resort (through a thick crowd of people), we finally were at our room. 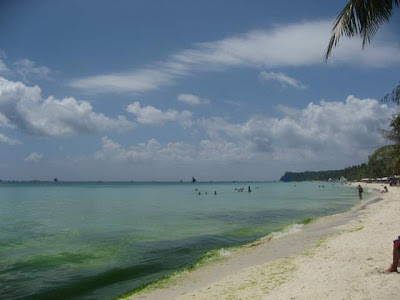 I was a bit put off by all the people, way more than I have experienced before at Boracay. I did know that there were going to be more people this time, since it is summer in the Philippines now, and thereby peak season, but it still was a bit of a shock. The picture below was taken the day after our arrival, and show all the algae, but not how crowded it was. 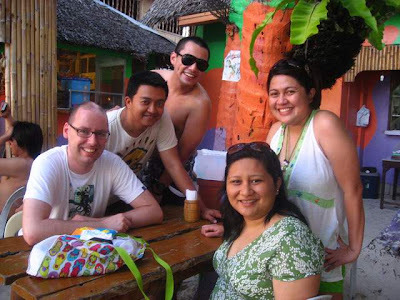 After a good time at Jonah's, where the shakes were as amazing as they always have been, we were feeling a bit happier about our Boracay trip. We also got to experience the amazing sunset! 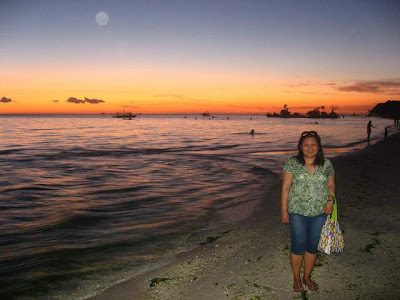 After the sun had set, Minnie and I went on a nice walk along the beach towards the north tip, towards the Sea Wind Resort where we had our wedding. We were starting to feel that Bora magic now, enjoying the cooling breeze and the calming sound of the waves splashing on the beach. As we came close to Sea Wind I couldn't help to start feeling a bit emotional, thinking about the amazing time I had here on our previous visit. Not only the wedding itself, even though that was the best time of my life, but also the days after with my family and friends from Norway. 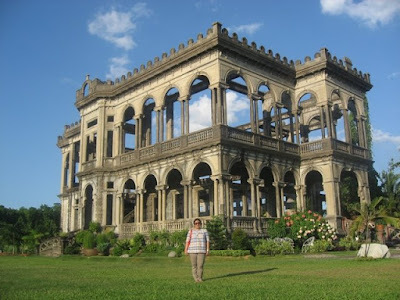 We had planned to visit some sites around Bacolod while there, so on Thursday we left for a trip to a town not far from Bacolod called Silay. This city once were the capitol of Negros Occidental, and has a rich history. At the street called Cinco de Noviembre (spanish for 5th of November, after the uprising against the Spanish on this date in 1898) there are a lot of Spanish-style houses. Most of the are in very poor condition because of lack of maintenance, but there are two exceptions, which both are museums. 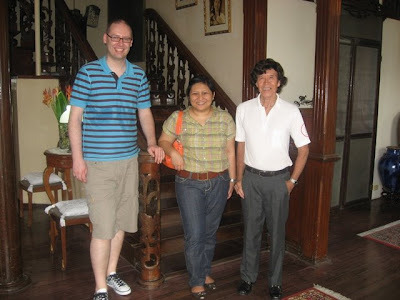 We visited Balay Negrense first, a big old mansion. Our guide was an old lady, which knew so much and also were really nice. 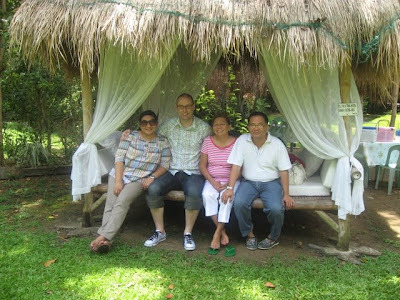 It was a very interesting visit, learning and understanding more of Filipino history. Afterwards we went to home of Ramon Hofileña, a retired swimming trunks model and manic collector of all sorts :) He is a very colorful character, but also a very nice and interesting person. On Wednesday the 9th, we went on another tour. This time my parents-in-law had picked the sites. First we visited Victorias Milling Company, said to be the worlds largest integrated sugar mill and refinery. We were taken on tour through one of the mills, seeing how sugar was made from the sugar canes arriving on trucks (no pictures allowed though). We saw the extracting of juice from the sugar canes, how the juice was purified and crystallized into brown sugar. We got to taste the sugar on the conveyor belt, which tastes just like brown sugar, not surprising :), but still hot from the processing. After the tour we went to see the church on the factory area, famous for it's mural depicting an angry Christ. One of the biggest difference between Norway and the Philippines is the cost of labor. 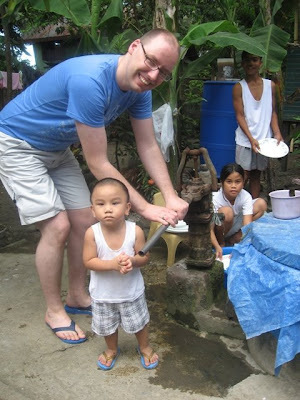 My first days in Manila have given a couple of good examples at that. At one of the restaurants we went to, there were two waiters involved in taking an order. One, first, to receive the order, and then another a minute after to go through and confirm the order. In Norway the waiters are so busy it sometimes can be hard to just get the attention from one so you can place the order. When you shop in a mall here, there are typically two or three person at each register. The first one enters all the items to the register and receives your card. The second one goes through the receipt and controls the sums, and then processes your card. There might also be a third one for putting your items in a bag. In Norway there's only one person at the register, and at the grocery store you must be quick to put your items in your bags to avoid delaying the next customer. However, what I think is the clearest example of the cost of labor in the Philippines was at the driving range I went too. When I was there I had a dedicated golf teacher training me. This would be very pricey in Norway. In addition there was a separate person to place a new golf ball ready for me after each shot. So I had two people working for me for one hour. The cost? 700 pesos, just below 100 Norwegian kroner, total. I think I would have to multiply the cost by ten and then some for the same lesson in Norway. On Sunday we finally arrived in Manila, after a lengthy and tiring trip. After dropping off our suitcases, taking a shower and changing clothes (those long trips really makes you feel dirty…) we were off to lunch with Valerie, Minnie’s sister, and Tin Tin, a close friend of Minnie. We ate at Italiannis at the mall called "The Fort", where we took the picture below. Tin Tin said she was going to treat us to this lunch since it just recently was her birthday. For me it’s still a bit strange that the one who is celebrated is treating, shouldn’t it be all the others treating the one who is celebrated? 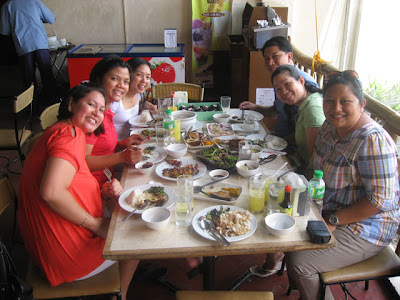 Anyhow, this is the custom in the Philippines, meaning that Minnie and I got a free lunch. Tuesday evening we again met up with former colleagues of Minnie for dinner, this time at “The Old Spaghetti House”. This place is owned by Cookie, which we met up with at Monday. 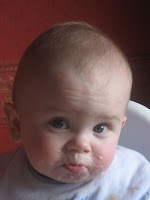 She sadly couldn’t be with us because of a strong allergic reaction to the crabs she had for dinner the evening before. However, we again had a really nice time, with good food and lots of laughs. There was one main big difference though, we finally got to treat!